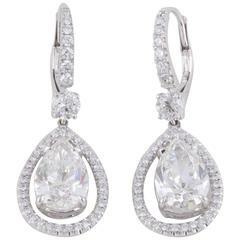 Stunning diamond drop earrings fashioned in platinum. Each of the 14 diamonds have been GIA certified and equal 5.91 carat total weight. The diamonds are all graded D-F color and VS2-SI2 clarity. The dangle earrings measure 1.5 inches in length.